Bed And Breakfast145 sq. ft. Guest accommodations in host's home: Bedroom with separate exterior entrance; private, attached full bath; deck overlooking river. The photos of the beds might be a little confusing: There are NOT 4 beds in the room; the photos show the 3 different ways the room can be made up: With a single bed (34" wide x 75" long), OR 2 twin beds (each 34" wide x 75" long), OR a large queen-size bed (68" wide x 75" long). We do have RESTRICTIONS on this room. Safe and pretty, it is ideal for a woman traveling alone, but please note: It is NOT available to couples unless they are traveling with guests booking our Lark Landing Suite. It is the perfect solution for a small group that does not want to sleep together in the Suite; for instance: two adult couples, or parents with older children, or two ladies or gentlemen who prefer separate quarters. 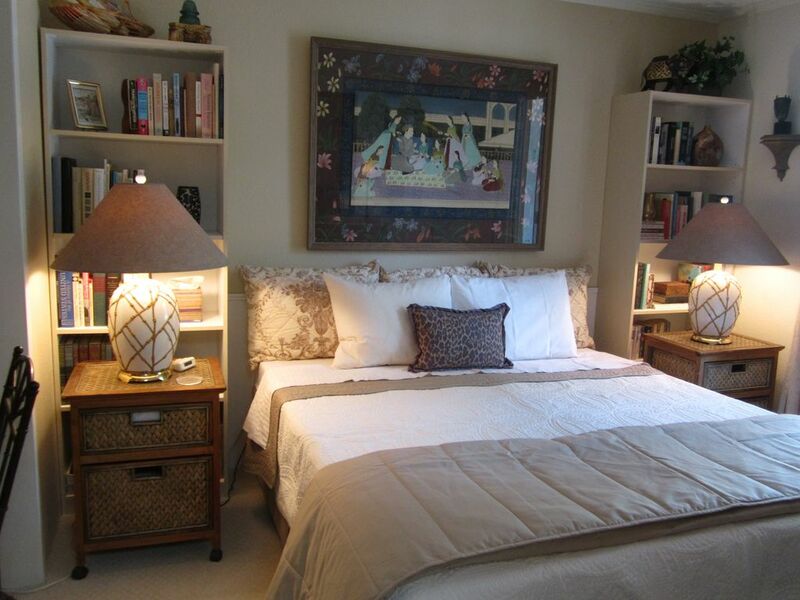 Professionally decorated, in addition to the bed(s), the room has a spacious work/laptop desk with chair, an easy chair, credenza, night stands with lamps, space to hang and store your clothes and belongings, and lots and lots of books. The updated, elegant bath has a toilet, pedestal sink, tub/shower combination, storage space, bath linens, soap, shampoo, conditioner and hair dryer. For guests traveling alone, breakfast is included in the room rate. Solo travelers also have the option of purchasing dinner with us so they don't have to eat alone in a restaurant. For guests associated with visitors booking the suite, breakfast is NOT included in the room rate but may be arranged for "ala carte." The host's kitchen is not available for guest use. The "Owner Photo" is me, Barbara, with hubby Mark at the elegant French restaurant, Le Petit Chablis, in Canon City for one of our wedding anniversaries. We are both retired, Mark as a certified court reporter (and does he have the stories to tell! ), me as a technical writer and former newspaper columnist. Well, to tell you the truth, we did not "choose" Florence -- it just happened to be where the appropriate property was after a 7-year search for a guest establishment. In the process, we slogged through every inch of Arkansas River mud between I-25 and the Kansas border before landing here. (One place we looked at Mark still refers to as the Manure Pit.) We wanted water, "ag" zoning so we could have goats, and something that was on the way to someplace so people might actually stay with us. We got it all -- and look forward to sharing it with you. Quiet, beautiful, rural setting yet close to city amenities. Professionally decorated accommodations; lovely, developed river frontage (no hiking through brambles to get to the water). You can fish right from the property, and you never will be lonely with deer, raccoons, chickens, ducks, geese, goats, cats -- and US -- to keep you company. Private, attached ("en suite") full bath. Guests may store a few items in the fridge, but the kitchen is not available for cooking. Will be set up in room upon request. Bicycling available if guest signs waiver releasing us from damages. I stayed 5 days at this property and found it to be a calming and peaceful retreat. It sits back from the road quite a distance so it was like I was in my own little world. I chose this property because it was adjacent to the Arkansas River and loved the calming effect and peaceful sounds of the flowing water. Barbara is the perfect hostess. Not only is she an excellent cook, she provided special considerations to make my stay more enjoyable. My room and bath were beautifully decorated and quite comfortable. Two thumbs up from me! This guest was a charming and delightful new friend and we were sorry to say goodbye. Any host would be honored to have her as a guest! the host has a duck pond, goats and my room was a stone's throw from the river. The environs are exactly what you would want in a bed-and-breakfast type stay. I would absolutely stay here again and probably will!